Tehran, Iran (CNN) -- The nephew of Iranian opposition leader Mir Hossein Moussavi was buried Wednesday, three days after he was killed in anti-government demonstrations. Seyyed Ali Moussavi's body was delivered to his family early Wednesday and buried at Tehran's Behesht-e-Zahra cemetery around 10:30 a.m. (2 a.m. ET). There were no demonstrations or disturbances during the burial, and several plain-clothed and uniformed security personnel were patrolling the area. A reformist Web site, Parlemannews, had reported Tuesday that Moussavi's body had disappeared, though the state-run Islamic Republic News Agency (IRNA) disputed that account. Moussavi was one of seven people killed in the riots Sunday, according to Abbas Jafari Dolatabadi, Tehran's chief prosecutor. The toll meant the riots were the bloodiest since June, when protests over the disputed presidential election that gave Ahmadinejad a second term left at least eight dead. The Iranian government has denied that its security forces killed anyone. It is not clear how Moussavi died, though his uncle's political movement said he was shot to death. Dolatabadi said one of those killed was fatally shot and the case is under investigation, but he did not identify the victim. He said most of the seven deaths occurred after the people were struck with "hard objects or due to similar causes." 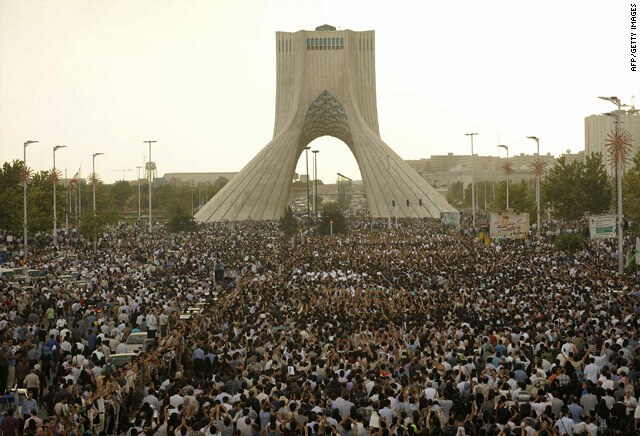 Mir Hossein Moussavi's Web site said the nephew was killed in the demonstrations by a shot to the heart. But IRNA said the bullet came from a "terror team," and that other such teams were operating in Tehran. It did not offer further details. The semi-official Mehr news agency quoted security forces Tuesday as explaining that the nephew was standing on a street at midday Sunday when he was "assassinated by firearm by the occupants of a passing vehicle, and died because of the delay in taking him to the hospital." "He died of severe bleeding on the way to the hospital," Mehr reported. "Efforts to identify the culprit or culprits continue." Parlemannews, which reported the disappearance of Seyyed Ali Moussavi's body, said the government was holding it and four other bodies for autopsies. The delay meant the dead could not be buried within 24 hours, as Islamic custom dictates.